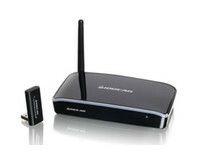 IOGEAR's Wireless 1080p Computer to HD Display Kit delivers High Definition video up to 1080p from your PC computer to your home entertainment center wirelessly up to 30 feet. With the utilization of the very latest Ultra-Wide Band (UWB) Wireless USB technology, wireless multimedia streaming is now more stable and more resistant to interferences than ever before. Enjoy your computer content on a big screen without cables stretching across the room. The GUWAVKIT4B's receiver is able to associate with up to 8 USB transmitters. Offers first come first serve wireless transmission, perfect for conference rooms, boardrooms and classrooms. Purchasing an additional back up transmitter dongle serves as a simple solution for sepearate location usage. The Wireless 1080p Computer to HD Display Kit provides line-of-sight, in-room transmission up to 30 feet, and is easy to install and operate. 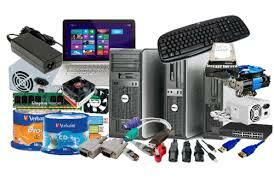 Plus, it is an ideal solution for both home and office use.